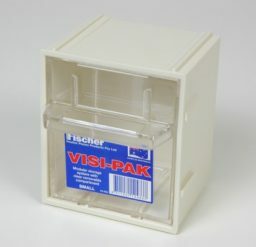 Fully modular the Visi-Pak is supplied with special clips which enable them to fit onto a louvre panel – doors swivel forward for easy access. They can also be screwed onto a wall or left free standing on a bench top. 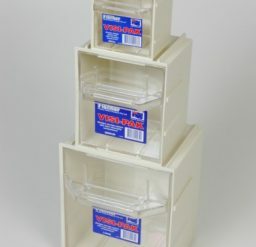 The Visi Pak keeps your products visible and protects it from dust all at the same time .